The Local Journo Thread - Page 19 - Hob Nob Anyone? Stick to baiting the kids in the summer holidays with your Reading FC Truth account Maffff. the irony being you're the one behind it? It’s got to be said, you are a massive fcuking prick OMA. maffff the irony being you're the one behind it? Another awful article from our friend Courtney Friday. Woeful attempt to stir the pot and push the anti Clement agenda. Give it up "Courts", Jaap isn't coming back. Club should ban him. Old Man Andrews Another awful article from our friend Courtney Friday. 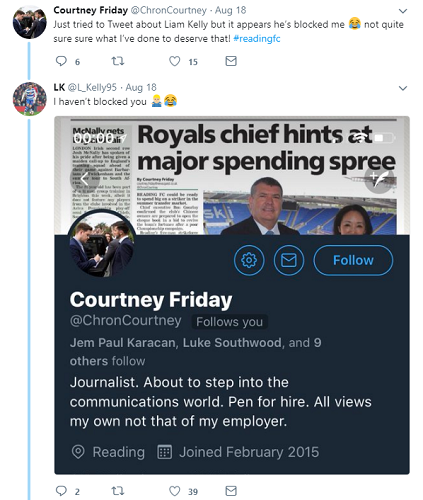 File Courtney under "Stam fanboy because he's a United fan"
How can you leave a job and then continue to use your pass to get into games for free? Surely it is fraud? Liam Kelly should then have proceeded to block him. I would have let him off for being so useless against Bolton if he had. "Reading FC: Chief executive Ron Gourlay hints at major summer spending spree"
I believe this is your first time in this thread. Are you friend or foe of the Reading Chronicle? How have none of them seen the Tevreden thing coming? Jonathan Low must have known that Charles Watts is close to Tevreden surely? Why is he not coming to him to get information? Just inept. Low appears to have no contacts at all at the Club; most of his articles have been on social media for days. I don't see the point any more of GetReading/In your area/London football or what ever it is now. Mid Sussex Royal Low appears to have no contacts at all at the Club; most of his articles have been on social media for days. I don't see the point any more of GetReading/In your area/London football or what ever it is now. And so quietly died, lonely and forgotten, Reading's one time daily local paper. Not really one for OMA's sustained attack on local media outlets but Low's ratings for the first 6 games are pretty laughable when it comes to the ratings of Illori, McShane and Yiadom. sandman Not really one for OMA's sustained attack on local media outlets but Low's ratings for the first 6 games are pretty laughable when it comes to the ratings of Illori, McShane and Yiadom. He gave everyone 5 irrespective of their performances. Low is saying tonight that Adkins oversaw Prem relegation...that's extremely harsh. We were as good as down when he came in. He joined on false promises after we'd just lost at home to 2 relegation rivals (Wigan & Villa) and had around 8 games left, most against the big 6. Anthony "Smudger Smith claiming he knows that the players care. The bloke hasn't been near a player since 1996, how the hell would he know anything?